The goal of this step is to be sure you have an elastic IP, and that it is attached to your instance. Sign into AWS and follow the steps outlined on Elvenware for setting up an Elastic IP. When you are done, take a screen shot of your elastic IP page on AWS. A single Elastic IP can be associated with only one instance at a time. When you switch from one instance to another, you might want to follow these steps. Exit from the 1st instance. Disassociate the Elastic IP with the 1st instance. Associate the Elastic IP with the 2nd instance. Sign on the 2nd instance. It is possible to create an EC2 instance programmatically. This makes setting up your instances very simple and very fast. Once aws is installed, you can create an instance programmatically. The --resources tag is the instance ID which you can easily find in the EC2 console. Make sure ssh-agent is running (eval ssh-agent). This step is already done automatically for you in pristince ubuntu because it is included in the .bashrc file I gave you at the start of the quarter. Load a specific key into the ssh-agent by running ssh-add. Take a screen shot of the Volumes page and show the Created date. I want to see that all three images you created were made on May 29, 2014 or later. In the screen shot shown below you can see two images that I created and the dates when they were created. Note that neither was created on May 29, 2014, or later, so they are not new enough to meet the requirements for this assignment. Your screen shot must show the date created and as many other fields as you can manage to show. I've cut this image off, so that it was not too big to view on your browser. But the image you create need have no such limitation and it must show that your images were created after May 28, 2014. It should also show your attachment information. My attachment information inludes the instance id i-94bc2dc7. Make sure that ID is visible in your screen shot. Increasingly, I'm finding that taskself comes with Ubuntu distros, so you may be able to skip that step. Right now you have to work with two SSH keys. The one from your Pristince Ubuntu instance, and the one on your AWS instance. There is no need for that. You can use the same key on both machines. This section describes how to do that. When you started work on your Pristine Ubuntu instance early in the quarter, one of the first things you did was create an SSH key pair called, by default, id_rsa and id_rsa.pub. If you put your id_rsa.pub key in the ./ssh/authorized_keys file for your AWS instance, then you will be able to SSH into your AWS instance and access your BitBucket repository with the same key. Note that your authorized_keys file already contains the public key for the key pair your created when you created your AWS instance. 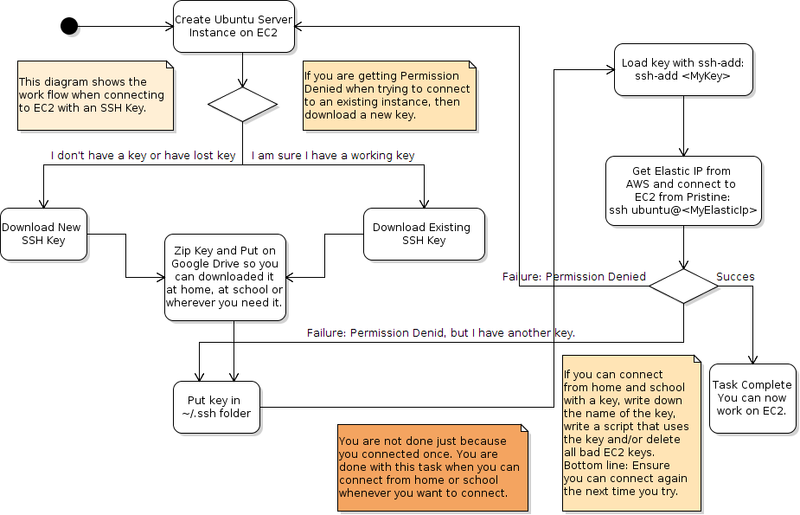 You need to add the id_rsa.pub file from your pristine_ubuntu instance to this authorized_keys file. Open the ~/.ssh/id_rsa.pub file from pristine ubuntu in Geany. Select and copy the key. Now switch to your AWS instance and paste your key into Nano. You know how to cut and paste. Just remember you have no mouse in Nano, and be careful not to damage your authorized_keys file. If you do, that will be the end of your instance. You will have to delete it and create a new one. You might, for instance, use the end key to navigate to the end of your existing key in your authorized_keys file. Press enter to create a new line. Now paste in your id_rsa.pub key. The result should look something like what you see below. Press Ctrl-O to save your work. Then press Ctrl-X to exit. NOTE: It's easy to accidentally press Ctrl-Z and exit the nano editor without really closing it. If you are in the editor, and suddenly find yourself back at the command prompt without quite knowing how you got there, try typing jobs to see if you have any running jobs. If you do, type fg to return to the editor. Be sure there is at least one blank line after the last command in the file. Now you should be able to push and pull from your repository without having worry about loading ssh-agent or your private key. ##Step 6: Clone your repository. Note the GET lines with the green 200 in them. Those show that your client is talking to your server. I'm looking for that kind of thing. I'm particularly interested in requests like the one for /getFullName. That shows you are requesting more than just HTML, CSS and JS files. In other words, requests for style.css, or Utilities.js are nice, but they just prove that your app is loading, They don't show that you are calling specific routes. Now let's talk about the output you get from the call to wget. See right at the bottom on the left where it says i-94bc2dc7? That is the Volume ID for my EC2 virtual hard drive. The ID was retrieved by using wget to pull down the results from accessing the specific URL shown above. Your results will be different than mine. I'm looking for your instance ID and matching it to the ID's in your second screen shot, the one that showed your three volumes. In total, your screen shots should show three ids, one in each screen shot. Each screen shot contains one instance id, and each one is different. That's three IDs, one for each instance. For instance, the sample screen shot I show here represents one screen shot and one instance id. In total, you will need to create three of these screen shots, one for each of your instances. I'm matching the ID returned by the call to wget to the id from the list of volumes in your previous screen shot. Create the three instances. Stop each on as soon as it starts. Create the first screen shot of the three volumes. Start the first instance. Provision it, create the second screen shot. Start the second instance. Provision it, create the second screen shot. etc. Create a folder in your repo called Week08Ec2Instances. Place your five (or more) screen shots in your folder. Push.